In the wandering dunes and swirling sand of deserts, Department of Geological Sciences Professor Emeritus Gary Kocurek sees the wind at work. To Kocurek, those shifting sands — often an analogy for ephemeral moments — are more like a film reel, a recording of how the wind etches patterns and pushes sand across a landscape over years, decades and longer. Although the full story may be out of reach, the best way to improve understanding of the geologic record is to keep an eye on the field. For the past 37 years at the Jackson School of Geosciences, Kocurek has done just that, conducting research at dune sites across the planet while teaching the next generation of geoscientist students how to read landscapes for themselves. Over the years, Kocurek has supervised 16 doctoral students, 22 master’s students and the honors theses of four bachelor’s students. He also served as one of the many instructors for GEO660, the school’s capstone field course, teaching undergraduates how to unpack the interlayered aeolian and marine deposits of Ghost Ranch, New Mexico. Now retired, earning the emeritus title in 2017, Kocurek doesn’t plan on leaving the field anytime soon. He spent this summer studying dune origins in Namibia’s Namib Desert. Later in the year, he’s heading out to a dune field in Monahan, Texas, to flatten a 300-square-meter area and watch how the dunes grow back. It was an interest that was piqued by a childhood spent outdoors in Southeast Texas. 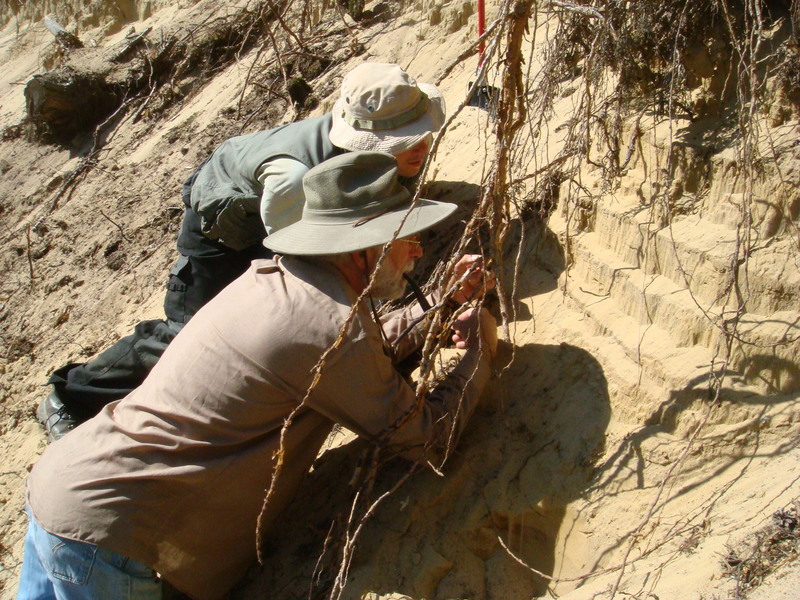 Kocurek distinctly remembers “discovering” stratigraphy at about nine years old, noticing how distinct layers of earth were exposed along the sides of a creek embankment. Those early experiences led him to a career in geosciences research. After earning his doctorate from the University of Wisconsin in 1980, Kocurek came back to Texas and joined the UT Department of Geological Sciences, his expertise in aeolian processes augmenting an already strong sedimentary research team. According to Jackson School Professor Emeritus Earle McBride, Kocurek developed a reputation in the department for his Spartan approach to fieldwork. He never brought a sleeping pad, and preferred staying out directly under the stars. He was also known for his work on dunes in Africa, including Egypt, Mali and Tunisia. Kocurek said the regions he traveled to were relatively stable places to conduct fieldwork, though in 1990 he was caught in Mauritania just as a coup was beginning. The main doors of the airport had been secured, so Kocurek crawled through an airport window to make the last flight home. Back on the UT Austin campus, Kocurek played a key role in bringing a geosciences education to new communities by working with then-professor and current dean Sharon Mosher to create “Earth, Wind and Fire,” a course for non-majors. Founded in the 1990s and still going strong today, the course is responsible for teaching thousands of students about how geosciences shapes the world and impacts society. dune fields from on high. In 2007, he worked with the National Park Service to establish an aerial survey of White Sands National Park in New Mexico, a 275-square-mile dune field that owes its blinding white dunes to sand made of gypsum grains. The surveys used LIDAR, a technique that captures elevation data using lasers, and have provided details about dune topography at the centimeter scale. Kocurek’s research at White Sands, helped provide some of the first evidence of dune-to-dune interactions in the field. In the early 1990s, computational models had predicted that dunes could combine or break one another apart. Working with doctoral students Ryan Ewing and Sarah Christian, Kocurek published research that documented the behavior happening in the dune fields of White Sands. Kocurek’s expertise in studying dunes from a distance caught the attention of NASA’s Mars Science Lab team. In 2012, Kocurek joined the team to help analyze formations spotted by the Curiosity Rover and provide guidance on the rover’s path to its final destination, Mount Sharp. Mackenzie Day, who earned her doctorate under Kocurek in 2017 and was also part of the NASA team, used data collected from Curiosity and wind tunnel tests to show that the mount was more of a mound, sculpted in part by wind eroding away sediment inside of a crater basin.